Devotees of Charlie Munger don’t hear a lot from him, particularly in comparison to the frequency of media appearances that his partner at Berkshire Hathaway Warren Buffett makes. But, when Charlie Munger talks, follower’s can be sure they’re always colorful. 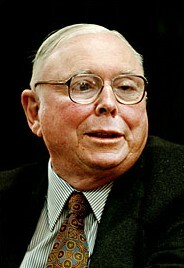 Charlie Munger is Warren Buffett’s partner and Vice-Chairman at Berkshire Hathaway, the investment conglomerate. In his capacity, Munger has been a behind-the-scenes co-thinker at Berkshire and has influenced many a decision made by Warren Buffett. Munger was chair of Wesco Financial Corporation from 1984 through 2011. He is also the chair of the Daily Journal Corporation, based in Los Angeles, California, and a director of Costco Wholesale Corporation. Unlike Warren Buffett, Charlie Munger has claimed that he is a generalist for whom investment is only one of a broad range of interests that include architecture, philosophy, philanthropy, investing, yacht-design, etc. Charlie Munger’s quotations and pithy comments have come to be known as ‘Mungerisms.’ Many Mungerisms are witty one-liners and maxims that reflect Charlie Munger’s humbleness and advocacy of elemental wisdom. Insightful books about Charlie Munger include Poor Charlie’s Almanack, Seeking Wisdom: From Darwin to Munger, and Damn Right: Behind the Scenes with Berkshire Hathaway Billionaire Charlie Munger.